Born: London, 19 August 1922. Education: Studied at Harrow School. Family: Married Phyllis Court, 1952; children: Edward, Nicholas. Career: Trainee in family shoemaking firm, H&M Rayne Ltd. (founded 1889), 1940-50; managing director, 1951-87; purchased half share in Delman, formed Rayne-Delman Shoes, Inc., 1961, president, 1961-72, and executive chairman, 1972-86; Paris shop opened, 1970; firm acquired by Debenhams, 1973 (itself acquired by the Burton Group, 1985); director, Debenhams, London, 1975-88; chairman, Harvey Nichols Stores, London, 1978-88; Burton Group sold off H&M Rayne to David Graham, 1987 (Rayne himself broke off ties with company); Graham sold firm to Richard Kottler, 1990; retired as chair of British Fashion Council, 1990; Rayne firm dissolved, 1994. Awards: Harper's Bazaar trophy, London, 1963; Fellow, Royal Society of Arts, London, 1971; Commander of the Victorian Order, 1977; Chevalier, l'Ordre National du Mérite, France, 1984; received Knighthood, 1988. Died: 7 February 1992, in London. 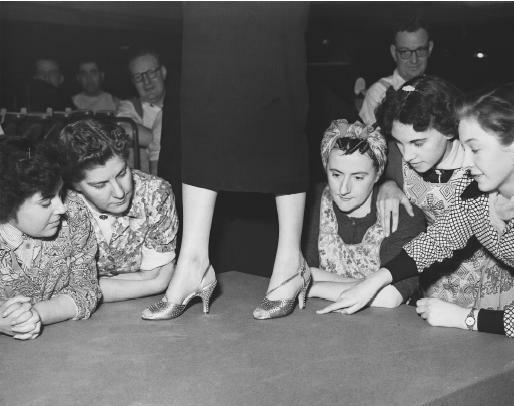 Sir Edward Rayne, spring/summer 1955 collection: workers inspect a pair of gold-studded luster calf shoes. Lambert, Eleanor, The World of Fashion: People, Places, Resources, New York & London, 1976. Swan, June, Shoes, London, 1982. McDowell, Colin, Shoes: Fashion and Fantasy, London, 1989. Tyrrel, Rebecca, "The Face of British Fashion," in the Sunday Times Magazine (London), 16 October 1989. "Edward Rayne," [obituary] in The Guardian, 8 February 1992. McDowell, Colin, profile in The Guardian, 10 February 1992. "Edward Rayne," [obituary] in the Times (London), 10 February 1992. "Edward Rayne," [obituary] in the Independent, 11 February 1992. Fallon, James, "Britain's Rayne, 69, Dies in Fire at Home," in Footwear News (New York), 17 February 1992. MacDonald, Laurie, "The Great Fashion Merchants," in Footwear News, 17 April 1995. Baber, Bonnie, et al., "The Great Design Houses (Shoe Designers Gucci, Rayne, Delman, Bally and I. Miller)," in Footwear News, 17 April 1995. LoRusso, Maryann, "1940-49—Stylish Sacrifices," in Footwear News, 26 April 1999. ——, "Walk of Fame—Celebrities Have Been Among Shoe Designers' Best…," in Footwear News, 26 April 1999. In 1918, when the second generation of Raynes took over the family firm, the idea of shoes as an article of fashion was a novel one. "The only people who bought stylish footwear were actresses and ladies of easy virtue," said Edward Rayne of the type of customer to patronize the first New Bond Street, London shop. This changed rapidly as the flapper age of the 1920s produced a breed of liberated and fashion-conscious women who demanded shoes like those worn by their idols of stage and screen. An H&M Rayne Ltd. advertisement of the time used popular actress Lily Langtry to promote the Langtry Shoe and the company won fashion credibility in a 1920s issue of Vogue when their button boots were described as the "smartest footwear in town." Long before stars of stage and screen were fashion leaders, trends were set by monarchs and aristocracy in the courts of Europe. When H&M Rayne received its first royal warrant from Queen Mary it was a sign the company had shed its risqué theatrical past and was respectable within the fashion world. Other royal warrants followed and a new generation of rich, famous, and aristocratic women patronized the company. These ladies were indeed well heeled, as H&M Rayne was the first British firm to introduce machinery from the U.S. to make the sole of the shoe more flexible. With American-style multiple fittings and sizes, a Raynes shoe had the comfort and fit found previously only in bespoke shoes. H&M Raynes' success as a British footwear fashion house to rival those of Charles Jourdan, Bally, and Miller came about in the 1950s. At age 28, Edward Rayne was still a young man when he took control of the family firm, and he led a hectic social life in Paris, enjoying night clubs and the company of fashion editors and glamorous diplomatic socialites. French and Italian design led the field in the 1950s and Rayne, from early on in his career, took an interest in promoting British design. In the 1950s when the buyers from important U.S. department stores came increasingly less often to London, Rayne courted them in the Paris couture houses and the fashionable night spots. Edward Rayne became chairman of the Incorporated Society of London Fashion Designers (ISLFD) in 1960 and within two years Vogue was hailing his remarkable success in persuading American press and buyers to view British collections. Other members of the ISLFD included Hardy Amies, John Cavanagh, and Norman Hartnell, who all designed shoes for Rayne. During the 1950s H&M Rayne produced classic styling that perfectly matched the rigid dress codes of the day. Times were changing, however, and the 1960s saw a fashion revolution in clothes, music, and dance. Edward Rayne called dancing the "language of the legs" and knew full well that what a woman wore to dance, and how she danced, would influence her choice of footwear. In response to the changing trends he contracted new British designers to contribute to the Miss Rayne range. Mary Quant designed her first leather stacked stiletto heels and Shirley Temple-style ankle-straps for Rayne in 1960. Later she was commissioned to design her own range, along with other young British designers such as Jean Muir and Gerald McCann, to produce collections in synch with the Swinging Sixties. Rayne made sure that alongside the sophisticated styling for one generation there was sufficient fashion and frivolity for the next. The quality of the footwear designs was matched by their production. Rayne was a shoemaker himself, having served an 11-year apprenticeship. He was, said Jean Muir, the "best British shoemaker of his age. He worked to a quality that matched anything from abroad." It is not surprising that in 1963 shoes by Roger Vivier were being made and sold exclusively by Rayne. In the 1970s shoes by Rayne were being used by leading French couturiers including Lanvin and Nina Ricci. The 1970s saw the fulfilment of one of Edward Rayne's personal ambitions, his first shop in Paris. It was the first British shoe-shop to open in Paris since John Lobb, which specialized in bespoke footwear. By 1985 H&M Rayne had some 70 retail outlets throughout the world. It was the Americans, Rayne claimed, who taught him to sell shoes, and he used his transatlantic talents to promote fashion design at the same time. Fashion writer Colin McDowell, writing in Shoes: Fashion and Fantasy (London, 1989) described Rayne as "a mover and a shaker to whom the British fashion industry owes a permanent debt." Before the ISLFD was formed, the idea that one could sell a fashion industry to a world market was unheard of—but Edward Rayne changed this outdated mode of thinking. For over 40 years, first through the ISLFD and then the British Fashion Council, he was involved in any scheme that would improve the image of British fashion. He used his contacts with royalty and governments to stage fashion shows, banquets, and receptions to promote British collections. British Fashion Week became a glamorous affair which helped persuade overseas buyers and press to visit London. In launching the British Fashion Awards in 1989, he brought catwalk shows to the public and, through television coverage, brought fashion to the attention of millions. Edward Rayne's contribution to the development of the British Fashion Council was the culmination of a lifetime's diplomatic pioneering—and partying—in aid of British design. He did more than any other businessman to persuade overseas buyers and press to take British fashion design seriously. By the time he retired from chairing the British Fashion Council in 1990, the Council had success and recognition worldwide as a promotional body, and Rayne had received a well deserved knighthood for his services to the industry. Are Edward Rayne boots (in particular the black & white ones seen on Mrs Peel in the Avengers) still available?